Recently 1-800-SWEEPER has begun heavily capitalizing on the influential power of co-branding. 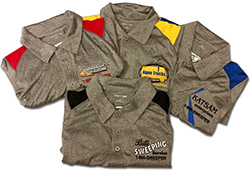 With co-branding in mind, 1-800-SWEEPER looked back at past initiatives and saw a great opportunity to be capitalized on with professional apparel. In the past, partners of 1-800-SWEEPER have worn white 1-800-SWEEPER branded shirts to various group functions. Though the shirts are professional, they did not convey the core concept of the organization. These shirts did not recognize the individuality of each of our partner’s unique businesses. 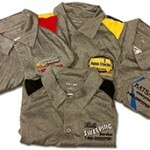 Partner companies will soon be wearing their co-branded shirts in their marketplace as well as at industry related events.